Elliot will be making his First Holy Communion on Sunday. As Roman Catholics, it's a pretty big deal. It's the third sacrament after baptism and reconciliation. It's a sort of coming of age and enables the child to play a full part in the Mass and to welcome Jesus to be fully part of them. As with all celebrations, a thoughtful gift can mark the occasion and provide something to remember the day. Mass and Prayer Book. As part of their preparation for the sacrament, the children learn all about the different parts of the Mass. A Mass and Prayer Book will remind them of this and guide them through the service each Sunday. Plus the prayers will help as they continue to grow in their spiritual journey. Personalised First Holy Communion Candle. In the Roman Catholic tradition, a candle represents Jesus - the Light of the World. In Baptism, a candle is given to represent the receiving of the Light of the World. First Holy Communion is when you receive the Light of the World for the first time in regular workshop, so a candle is a lovely representation of that moment. A Rosary. 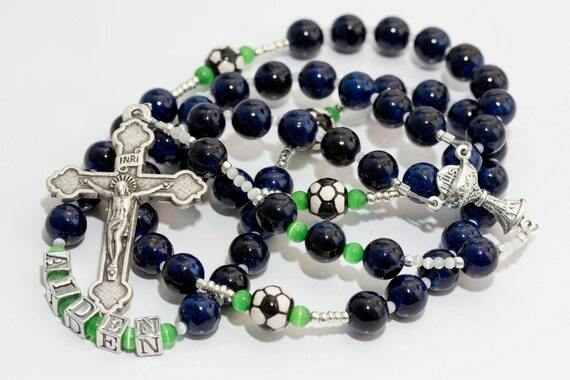 This personalised football first communion rosary combines my son's main passions in life. I'm sure he'd be more likely to use this to pray because it's personal to him and his life, reminding him that Jesus is with him whatever he does -win or lose. Personalised First Communion Picture Frame. What better way to remember the special day than with a picture frame featuring a photograph taken on the day? This wooden frame includes the words used in Mass as well as the name of the child and the date. Personalised cross cufflinks. Making your First Holy Communion is a real milestone in the Roman Catholic church - a sign you are growing up and know your own mind. So why not reflect that with a grown up gift? These cufflinks not only reflect that Christ sacrificed his body and blood on the cross for us, but also mark that the child is maturing. And the initials add a personal touch to show that we each have our own connection with the Lord. Now I just need to find a suitable card! And think of some small tokens of appreciation that I can give to the catechists and Elliot's prayer partner. Have you given or received a special First Holy Communion gift?